Repair puncture related flats on ATVs, Mowers, Trailers and Wheelbarrows. 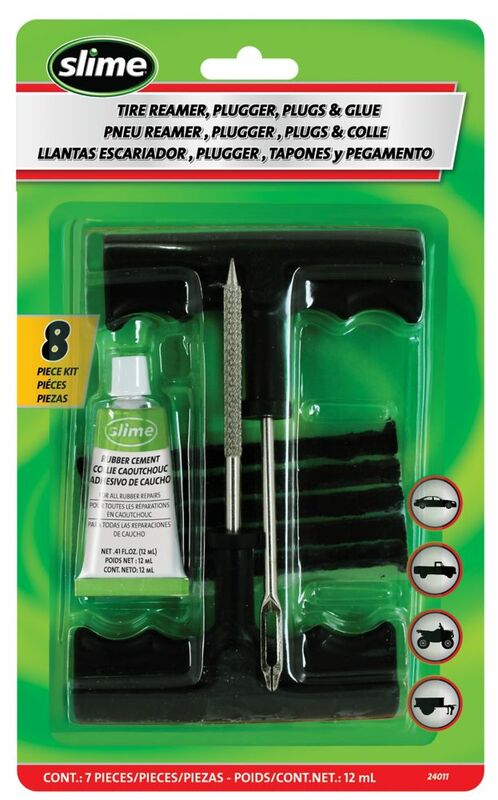 Rubber Cement, T- Handle Reamer Plugger Tools and Plugs Refill with Slime Tire Plugs. For Tubeless Off-road Tires: ATVS, Wheelbarrows, Mowers and More. Contains: T-handle reamer, T-handle plugger, 3 tire repair strings, 12ml rubber cement tube. This Logix 15pc Emergency Kit is ideal for any vehicle. Everyone should have one. The set is equipped with durable and useful tools for basic roadside repairs. Includes: Flashlight, Tire Pressure Gauge, Booster Cable, Slip Joint Pliers with 6 inch CS/PVC handle, Warning Triangle, 6 pc Tire Repair Tools and 2 pc Screwdriver Set. All stored in a convenient reflective carrying case. Sl Tire Plug Kit W/ T-Handle Repair puncture related flats on ATVs, Mowers, Trailers and Wheelbarrows. Rubber Cement, T- Handle Reamer Plugger Tools and Plugs Refill with Slime Tire Plugs. For Tubeless Off-road Tires: ATVS, Wheelbarrows, Mowers and More.